From direct frontal view, some women complain of bulging fat that protrudes over the sides of their bra in the region of the front of the armpit. The medical term for this region is the “anterior axillary fat pad”. This fat pad can be quite bothersome when wearing bathing suits, sleeveless dresses, formal dresses, tank tops, etc. Even some thin women develop a disproportionately large fat pad in this area. In general, this fat pad becomes increasingly prominent with increasing age. Breast augmentation does not improve the appearance of a bulging fat pad in the front armpit region. Look at yourself in the mirror while wearing your standard everyday bra. 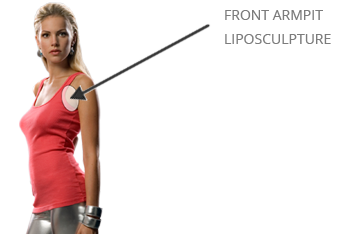 If you notice bulging fat that seems to flow over the sides of your bra in the front armpit region, then you may be a good candidate for liposculpture of the front armpit zone (axillary fat pad). Dr. Hayduke prefers to perform this procedure in the office under local anesthesia. Since this is an exceptionally delicate area, he uses extremely small instruments/cannulas. Compression over the treated area is only necessary for 48 hours. Clients can return to work after two days.